Quietly beating out rivals Hertz and Avis, this privately held outfit reigns as the No. 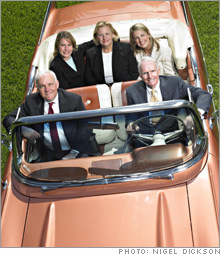 1 car-rental company in America, and the Taylor family aims to keep it on top. (FORTUNE Magazine) -- There are a couple of things you might not know about Enterprise Rent-A-Car of St. Louis. One is on the order of business trivia: The privately held company hires more college grads than any other American corporation (and promptly puts them to work washing cars). Enterprise founder Jack Taylor at the wheel. Clockwise from his right are son Andy, granddaughter Chrissy, daughter Jo Ann, and granddaughter Carolyn. "I'm having fun." That's how CEO Andy Taylor describes his never-stop worklife. The second one is a bit more significant: Though the fact amazes many businesspeople, Enterprise is by far the largest and most prosperous rental-car company in the U.S. For its fiscal year ending July 31, Enterprise will have about $9 billion in revenues, against the $7.5 billion that the runner-up, Hertz, recorded in calendar 2005. This is not a one-shot phenomenon. Enterprise has led Hertz in revenues since the late 1990s, with the other big rental names - Avis, Budget, National - eating the dust behind. The eminence of Enterprise will be particularly startling to those whose main experience with rental cars is on business trips. That's because Enterprise is the king of the off-airport market - it does most of its trade out of downtown and suburban locations, while Hertz rules the on-airport business. Both sides, though, are trying to repaint the picture. Hertz has significantly expanded its off-airport branches in the past couple of years, and Enterprise has spent a decade nursing a still-small but ever-growing airport presence. The face-off between the two companies is therefore sharp and interesting. But it is also poorly understood by the business world because its denizens know so little about one warrior in the fight - this very private entity, Enterprise. Well, we're here to lift the curtain and give you an inside view of a very unusual operation. Most of all, it's a classic American success story - constructed by a family named Taylor, whose Enterprise crew is shown in the photo above. Jack Taylor, now 84, started a tiny auto-leasing business in 1957 and eventually renamed it after the aircraft carrier Enterprise, on which he had served as a Navy aviator. 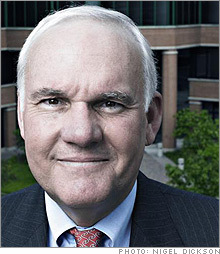 Jack's son, Andy, 58, became president in 1980 and CEO in 1994. To the entrepreneurial engine that Jack had built, Andy added strong, professional management of a quality that surely makes him one of the best CEOs in the country. His sister, Jo Ann Taylor Kindle, 56, handles much of the Taylor and Enterprise philanthropy, which has enriched many a cause, particularly in St. Louis. And coming on is the third generation: five girls in all, two of whom - Chrissy Taylor, 30, one of Andy's daughters, and Carolyn Kindle Payne, 29, one of Jo Ann's - work for Enterprise. Known around the company as the "G-3s" or simply "the girls," the two have managerial posts now and are also making the rounds to learn every aspect of the company's business. Still, like almost everyone else at Enterprise, they started as management trainees who not only swabbed down cars but also carried out Enterprise's signature promise: "We'll pick you up." Within this down-to-earth, quintessentially Midwestern family, there is a certain bemusement about just how far Enterprise has come. Says the tall, lean, and sharply dressed Jack Taylor, retired now from active management but an ardent tracker of all that transpires in the company: "Enterprise sort of grew by itself. I never thought it would be more than a small to medium-sized business. I knew I wanted to live reasonably comfortably and to get a couple of new cars every two or three years, and I thought that if I was really successful, I would have maybe a condominium in Florida and a reasonably nice house here in St. Louis." He could buy a major slice of either place. The Taylors, who own almost all of Enterprise, do not publicly disclose how much it makes. But FORTUNE's interviews and various triangulations allow us to estimate with some confidence that profits this fiscal year, on that $9 billion in revenues, will be upwards of $700 million. That compares with the $378 million that Hertz made in 2005, which was its best year ever. Or consider what Enterprise might be worth were it public. Last year Ford sold Hertz to a private-equity group, which - wasting no time, obviously - is right now preparing to sell new shares to the public at an equity valuation of perhaps $7.5 billion. That would be about 20 times last year's earnings. Were Enterprise to be valued in the same simplistic way on, say, $725 million in profits, it would be worth close to $15 billion. As a business, however, Enterprise is superior to Hertz in more than dollars - not nearly as cyclical (partly because it has very little exposure to the volatilities of air travel), much less leveraged, and sounder all around. Enterprise's true equity market value is probably in the neighborhood of $17 billion. But that's all academic, because the Taylors devoutly wish to retain what Andy Taylor calls "the privilege" of being private. "I can't imagine," he says, "that we would go public." Families head in that direction, he believes, "if they lack a consensus - if everyone wants to take a piece." That would describe, he says, another St. Louis family, the Pulitzers, who sold their publishing company to Lee Enterprises last year. But everyone in his own family, says Taylor, is "right now on the same page, which is that we want to have a large, multigenerational family business." True, were Jack to die soon, estate-tax problems could materialize. But in an effort to head them off, Andy says, the family has been working to "liquefy" Jack. That word suggests too much Jim Beam. In reality it means that Enterprise is putting as much cash as it can into Jack's hands so that his estate can easily pay its taxes. In the meantime, Jack is well and playing lots of golf, some of it at a course near St. Louis that the Taylors indirectly own, Boone Valley. That leaves Enterprise's management in the hands of son Andy, whom Jack described in a recent interview as perhaps "more earnest than I am." Jack then rose to check that word in a dictionary, finding with satisfaction that it fits Andy's seriousness of purpose, which is simply to beat the daylights out of every competitor extant. Capable of being funny as well as earnest, Andy is shorter and stockier than Jack and less sartorially keen. Not supremely athletic, and asthmatic in high school besides, he nevertheless starred there in football - "willing himself," says his sister, "to be good." At age 16 he jockeyed cars at Enterprise; later he got an undergraduate business degree at the University of Denver. Today he works prodigiously, flying up to 300 hours annually on business and coming into his St. Louis office on Saturdays when he's home. "Our branches are open on Saturday mornings," he says. "My father worked then, and I do too." Hard work, an intense focus on the customer, an imaginative and unceasing use of incentives - these are the fundamentals of Enterprise's Taylor-made culture. But the company's distinctions would never have had a chance to develop had not Enterprise at the start adopted its unusual business model, staying out of airports and sticking instead to what it calls the home-city market (a.k.a. the off-airport market). There, spared the concession fees and extended staffing requirements of an airport location, and operating leanly besides, Enterprise became the low-cost producer of the rental business. It then rode - and by its marketing even helped produce - a strong surge of growth in the home-city business that has swept it past the airport segment. Statistics that Auto Rental News reported this year indicate that the off-airport car-rental market reached about $10 billion in revenues in 2005. Of that business, Enterprise had a mammoth share of around 55%. "Leisure" rentals, in which customers pick up a minivan for a vacation, say, or salesmen use an Enterprise car rather than their own, have helped propel this market. But the indispensable customers for Enterprise are auto insurance companies, which sell "replacement" coverage to defray the cost of a rental car if an accident puts a policyholder's vehicle in a repair shop. Enterprise's climb has unsurprisingly made it the largest buyer of cars in the world: This fiscal year it will purchase more than 800,000 and feed them out to its omnipresent branches, now totaling 6,900 in the U.S. and four other countries. One part of the company's international business, Germany, is in the red. But in other ancillary operations, like truck rental and the leasing of small auto fleets to corporations, Enterprise is rolling along. In all its operations, the company is very competitive in price - not always the low guy, but usually close to it. Enterprise sort of fell into its business strategy. Having started in auto leasing and transited into rentals, the company was naturally operating out of downtown locations, and it just stayed there. In the early years, moreover, Enterprise seems to have cruised along under the radar. One Hertz veteran says that it was only when Enterprise began advertising nationally in 1989 that Hertz management woke up to this competitor. Well, whoa! - Enterprise had more than $600 million in revenues, and it does seem that Hertz could have noticed earlier. Hertz definitely isn't snoozing anymore. It has increased its off-airport locations by 44% in the past two years, to 1,200, and its new private-equity owners, Carlyle, Clayton Dubilier & Rice, and Merrill Lynch Global Private Equity, say they will expand further. Meanwhile, Enterprise by 1995 was making its move into airports. It's in 220 locations now and has more than 7% of the market (vs. Hertz's 29%). Why airports at this late date? Because Enterprise's home-city customers began asking, so the company says, for airport service. Dipping a toe into the water, Enterprise discovered it could make the business work, so it moved in. In the home-city market, Hertz will be working to raise its share of the burgeoning "leisure" business. But the company's central challenge will be to make the grade with the emperors of referral, those auto insurers. Upon the unfortunate, often emotion-charged occasion of an accident, many drivers don't have a clue about where to rent a car. And there is the insurer with a couple of soothing suggestions. Or maybe only one, because in this world, nobody has the might of Enterprise, which grew up focusing not only on insurers but also on their close collaborators, auto-repair shops. Enterprise gets about $3 billion in revenues, or one-third of its total, from U.S. insurers. At dozens of the biggest companies, Enterprise is the "preferred provider," a designation practically always meaning that the two parties have agreed, among other things, on a per-diem rental rate. Enterprise employees are stationed full-time in the offices of many insurers. Often they're booking rentals on an Enterprise computer system called ARMS (for automated rental management system) that links to all of Enterprise's locations. The company, in fact, has applied for a patent on the latest version of ARMS. About that project Enterprise is proprietarily mum. But its patent application yields the arresting fact that the company sees a possibility of ultimately using ARMS not only to book its own replacement business but also that of competitors wanting to use its technology. For Enterprise, that might mean fees. It might also leave the company looking a bit less like a territorial gorilla. Hertz, in any case, isn't loving Enterprise's patent plans. Hertz said in its 2005 10-K filing that Enterprise has asserted that some of Hertz's own software appears to infringe patents Enterprise is seeking. Were it found guilty of infringement, Hertz said, it might not only have to pay damages but also face "material" competitive disadvantages in building its off-airport business. But then again, Hertz has one big point in its favor: Enterprise is so strong in replacements that insurance companies want alternative providers. That certainly doesn't mean they lack respect for Enterprise. One insurance CEO that FORTUNE talked to on background marveled at Andy Taylor's work ethic, saying that "he goes at it harder" than any vendor the CEO deals with. Since it can't logically be money that's driving Taylor, said the insurer, it has to be "pride." But, he added, "I still want him to have competition." One place indeed that Hertz appears to have made some progress is at giant State Farm, where it now has, says one Hertz executive, "a foot in the door." Even so, the scale of Enterprise's branch network is a formidable challenge for Hertz. Andy Taylor admits to "constructive paranoia" about competitors of any kind. But he sees the private-equity status of Hertz as another factor bad for it and good for Enterprise. There is always the question, of course, as to whether a private-equity owner is truly going to finance expansion. But Taylor's argument rides particularly on interest costs, which are major items for rental companies because they must finance fleets of cars. Enterprise's strong balance sheet leaves it with an A- rating on its unsecured debt and rates of around 6.2%, while Hertz is contending with a B rating and rates close to 9%. Going by Enterprise's record - by the up-from-nothing history that has earned it both credibility in the debt markets and $9 billion in revenues - you might not want to bet against it in any competition. From the moment that Jack Taylor, fresh from working for an automobile dealer, got started in the leasing business 49 years ago, he was a striver. To reclaim cars from deadbeats, for example, Jack and his first wife, Mary Ann (they divorced much later), would pile their small, pajama-clad kids, Andy and Jo Ann, into the back seat and in the dark of night descend upon the lessee's house. Jack would then use a spare key to spirit the lessee's auto away while Mary Ann drove their own car, and the kids, back home. Later, in the early 1960s, the still-tiny Enterprise began to focus on a related business, daily rentals. Don Ross, 62, now president of Enterprise, remembers working the lobbies of St. Louis office buildings, trying to identify tenants that might have an occasional need to rent cars. A receptionist at AAA's building mentioned a meeting of insurance adjusters about to take place. The next morning Ross handed out Danish and coffee - and business cards - to prospects filing in. The insurance arm of AAA Missouri (which is still a customer) became the first insurer on Enterprise's rolls. As the business grew in St. Louis, Jack Taylor laid down rules for doing things right. One of his sayings is today often quoted at the company: "If you take care of your customers and employees, the bottom line will take care of itself." In time, success with that philosophy encouraged the risky leap out of St. Louis - first to Atlanta, then very gradually nationwide. Along the way, Enterprise branch managers, typically operating out of the same kind of low-cost, storefront locations they do today, sent St. Louis new ideas they'd tried that gained business. The concept of picking up customers at their homes was a field innovation that bordered on genius. Never mind that it often leaves a branch's employees scrambling to both tend the store and shuttle cars. It is the one feature that most identifies Enterprise and is therefore priceless. Financially, Enterprise innovated too, especially in handling its cars. The standard practice among rental-car companies is to buy their cars from manufacturers with a contract to sell them back within a year or less. That leaves the manufacturer with the used-car risk. Jack Taylor, figuring that Enterprise could deal with that risk ably, concluded that Enterprise would not sell its cars back but would unload them itself. That business is a "gamble," says Andy Taylor. During the gas shortages of 1974, in fact, Enterprise was losing so much money on its inventory of used cars that the Taylors started diversifying into totally unrelated businesses. A company that the family formed then, called Centric, today garners more than $600 million in annual revenues from, among other less exotic pursuits, selling provisions to prison commissaries. But when demand for used cars is robust--as it is right now, for example--the gamble pays off. Enterprise sold about 775,000 cars in fiscal 2005 and did it, so it appears, with flair. "We know when to sell," says chief operating officer Pam Nicholson, 46, "and we know what to sell. This is a very complex part of our business." In another early-years feat, Enterprise developed a remarkable system of both hiring employees and spurring them along with incentive pay. On the bottom employee rung are all those college graduates Enterprise signs up as management trainees: about 7,000 a year, recruited from 220 U.S. and international campuses. What kind of students does Enterprise like, and vice versa? That's simple, says Marianna Savoca, director of the career center at Stony Brook, a part of New York State's university system: "The students that fit are highly motivated, positive, energetic, and enthusiastic." They need to be, because starting pay currently is mid-grade, $30,000 to $38,000 (depending on location), and the work is hard. Enterprise has been sued in the past by workers claiming overtime pay, so company executives are precise today in saying that a standard workweek is no more than "49� hours." A company publication also recently said that "every Enterprise employee is entitled to a lunch break," which suggests they may sometimes struggle to get it. Meanwhile, the staff is required to be in business dress, including shirts and ties for the men (among whom facial hair is not applauded). The job isn't for everyone - that's for sure - and almost half of the new hires don't last a year. But if a young kid makes it one rung higher, to assistant manager of a branch, he or she gets slotted into a powerful incentive-compensation system that sweeps right up to Andy Taylor. In this structure, each branch is a profit center - a small business run by managers whose monthly compensation depends heavily on the profits they make. The comp scheme then ladders up the line to areas, regions, and groups (all staffed by homegrown employees). Enterprise's field operations end up being a collection of pyramids, with supervisors at various levels earning percentages of all that is made below them. At the top of the pyramids, pay can be in the millions. This whole structure has produced field managers who are highly independent - to the degree, says Andy Taylor, that "they're almost like franchisees." These managers determine their need for cars, open branches, sell used cars, and, within limits, set rental prices. Or maybe not within limits. A major insurer who has long had a close relationship with Enterprise complained recently to FORTUNE that one of his competitors was getting better prices than he was. This did not make the insurer feel friendly toward Enterprise. He in fact was doing some business with Hertz and thinking that the competition between it and Enterprise "could be quite a battle." Hearing from FORTUNE about this complaint - with no names attached - an Enterprise executive wished for further details, saying the company would like to follow its practice of leaping upon every known customer problem and trying to cure it. Because overhead charges imposed by St. Louis headquarters cut into what the branch system makes, the top guns in the field can on occasion get very vocal about strategies that might cost them money. In the late 1980s, as a major example, Jack Taylor thought it was essential for Enterprise to begin advertising on television nationally in order to subtly signal to its insurance customers that it was a company of substance, not some fly-by-nighter. The field argued that the expense wasn't necessary. But when the Taylors wish to exercise their clout, they can. Jack overrode the objections, putting his faith in a New York City agency, Avrett Free Ginsberg. It came up with the idea of an Enterprise car wrapped in brown paper, whizzing up a hill--on its way, presumably, to pick up a customer. That was the ad and the icon that in 1989 so startled Hertz's executives. The icon is still used in all Enterprise ads, and their creator is still the same agency, AFG. On another occasion a few years later, Jack got furious at reports of customer complaints and a general collapse in service. From his wrath came a new service yardstick called the Enterprise Service Quality index, or ESQi, derived from prompt follow-up phone calls to one out of every 15 Enterprise customers. The survey asks just two questions: First, on a scale ranging from "completely satisfied" to "completely dissatisfied," how would you rate your last Enterprise rental experience? Second, would you rent from Enterprise again? The answers to the first question are next compiled into an index. Each segment of the company - each branch, for example--then gets its score. And here is the kicker: If the ESQi for your bailiwick doesn't at least meet the company average, you don't - absolutely don't - get promoted. In March, Enterprise's overall ESQi reached, for the first time, a level of 80 - meaning that 80% of all respondents had answered "completely satisfied" - an extraordinary score given that there are surely some people who couldn't bring themselves to give that answer under any circumstances. Then, too, at least some renters are now and then going to get an Enterprise car that doesn't have a bandbox look. On the other hand, there are those well-scrubbed young people in the branches who understand that both their careers and their pay ride on ESQi and seldom forget it when a customer walks in - or gets picked up. You have to surmise that the friendliness of Enterprise's people drives that score to 80 and drives the business besides. Andy Taylor is an enthusiast about ESQi, and he expects it to be a key engine of the growth he sees stretching before him. In his vision, Enterprise will enjoy steady progress in all its businesses, including new ones it might think up. True, there are a few clouds around, most notably the threat that the Delphi bankruptcy will shut down GM and leave Enterprise short of cars. But when you are the largest buyer of cars in the world, you can expect that someone will strive to keep your supply lines filled. If there's trouble, Taylor says, "We'll be 'shorted' less than others." Meanwhile, Taylor will be plotting alternative ways to grow, in an organization that just can't imagine not getting bigger and more profitable year after year. Hertz will have Taylor's close attention, no question about that. But in talk, he virtually lays down the gauntlet: "We own the high ground in this business, and we aren't going to give it up." One person who has long watched Taylor's optimism in motion is analyst Betsy Snyder of Standard & Poor's, who rates the debt of U.S. car-rental companies. She knows everything about Enterprise, including past profits and future expectations, and she is a believer. "They have always delivered," she says admiringly. "If they say they will do something, they do it." For any company, that is a high-class definition of success.